Drugs, alcohol and gambling. With those already under tight control, the South Korean government wants to add a fourth vice to the list – online gaming. Earlier this month, South Korean lawmakers proposed a bill that regulates online gaming in a similar fashion to drugs and alcohol. As local news reported, the country's Ministry of Health and Welfare took a step further [ko] towards the restriction last weekend by designating the online game as one of the four major addictive elements [ko] which merit state-level control. Net users have erupted with jeers and criticism, and the proposed regulation has unsurprisingly drawn severe backlash from members of the gaming industry who are enraged to be considered in the same category as drugs and gambling. 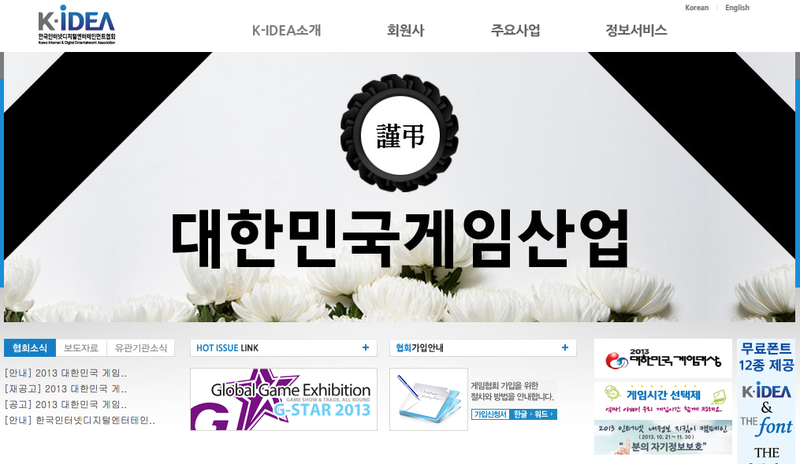 New main image of the Korea Internet and Digital Entertainment Association's website that wrote “Condolence to the Republic of Korea's Gaming Industry”, implying that the government's decision will bring death to the Korean game industry. Fair Use Image. The Korea Internet and Digital Entertainment Association posted an online petition [ko] in their website, arguing that the government's decision will bring death to the Korean gaming industry, which makes up 60 percent of the nation's entire contents market. Only few days have passed, but it has already gathered over 55,000 signatures. I welcome this news of designating game addiction as a disease. I will definitely be diagnosed as suffering from game-addiction at the company hospital. Once game addiction is acknowledged as a disease, then I would qualify for sick leave, and even be deemed to be disabled! I could even use the first-degree disabled person sticker on my car to get discounts. Gaming is so worth trying! The reason why the issue of online gaming addiction is being blown out of proportion is because many struggle to understand the concept of “virtual reality”. People tend to develop irrational fear for something they don't understand. Actually, I think no one has clear idea on how the gaming [industry] will develop. Several years ago, the authorities presented some statistics on gaming addiction which were later found to actually be data on Internet addiction. It was a data set unqualified to be used as an evidence for gaming addiction. Furthermore, that study is thought to be bit groundless. Nowadays, they even don't try offering any data sets and blindly claim that gaming leads to addiction. Gaming addiction issues are no longer a topic for a rational debate. @kinophio: There are at least three layers (of interest groups) involved in the gaming addiction debate: political groups desperately seeking supports from the parents, government divisions and private organizations who want to secure their status and money source, and lastly, parents who genuinely hate the game.